How to choose surface tensiometer /tensiometry_USA KINO Industry Co., Ltd. There are a lot of surface tensiometers with different measuring methods, made by different manufactories. And quality and working accuracy of these surface tensiometers are quite different from each other. How to choose the most suitable surface tensiometer for us is more important. This article will show you how to begin your surface tension measuring experience by choosing the most suitable surface tensiometer from different manufactories in worldwide. 1, Startup choosing surface tensiometer (tension meter) from measuring method of surface tension? Referring http://www.uskino.com/news/55.html for more information about method. here are main commercial tensiometer includes max bubble pressure tensiometer, max drop volume (max drop weight) tensiometer, optical tensiometer (drop shape analysis system based on pendant drop method or sessile drop method) and force surface tensiometer based on weighing method. First two tensiometers are always used to measure dynamic surface tension (perhaps with poor measuring accuracy of surface tension). Among them, max bubble pressure tensiometer is more common. But recently, scholars start to use optical tensiometer based on oscillating method to measure dynamic surface tension and experiments show that better results can be achieved than first two. But measuring accuracy of optical tensiometer is about 1-2%. It is worse than force surface tensiometer ( About ±0.2mN/m or dyne/cm). So, in this article, we discuss how to choose force surface tensiometer only. You can find how to choose tensiometer based on other methods in our web. There are two main measuring methods including Du Noüy ring method and Wilhelmy plate method for force tensiometer. - Hard to keep levelness of ring for Du Noüy method. - And more important disadvantage of Du Noüy ring method is it cannot be used to measure surface tension of viscous sample such as glycerol and adhesives. Main reason of it is same as class Wilhelmy plate method as shown below. More precise method for force tensiometer is Wilhelmy plate method. If you want to choose tensiometer just based on Du Noüy ring method, we think that it will mislead you. But when you are budget shortfall for surface tensiometer, you can choose Du Noüy ring tensiometer such as surface tensiometer model A3 that is used balance from KINO or tensiometer made by Fisher. Cheaper tensiometer: left one is Classical Du Noüy ring Tensiometer used torsion wire sensor, middle one is tensiometer made by fisher and right one is tensiometer model A3 made by KINO which used balance as sensor. Please be noted that KINO is only one that provides tensiometer at price about 1500USD using balance. There are several variations of the Wilhelmy plate methods. All are based on balancing the static forces of surface tension, gravity, and buoyancy acting on a thin plate (usually made of glass or platinum) suspended vertically in the air-liquid interface. - The zero-buoyancy method (Kawanishi et al. 1970; Lane and Jordan 1970): plate was immersed and withdrew and was kept stationary at zero depth of immersion. Then, measuring force of tension and calculating surface tension from equation. Generally, we will measure about 10 value of surface tension versus time and average them, and we will consider this averaged value as final value. - The detachment method (Furlong and Hartland 1979): the plate is quasi-statically pulled up until it is entirely free from the liquid ( detachment mode). As the instant of breaking loose is well-defined, the force at that moment can be rather easily determined. - The immersion method (Gaines 1966): Plate is immersed below interface of liquid-gas or liquid-fluid at a constant position such as 1mm, and correcting buoyancy from calculating buoyancy by this height and side of plate. - The maximum-pull method (La Mer and Robbins 1958; Loglio et al. 1976; Gaonkar and Neuman 1984): Plate is pulled up until max value is gotten. In this method, plate is not pulled up quasi-statically and meniscus may be ruptured before Wmax reached. Recently, KINO proposed a new method name modified Wilhelmy plate method. What separates them from four method described above is we consider buoyancy and contact angle is always existing during measuring process. 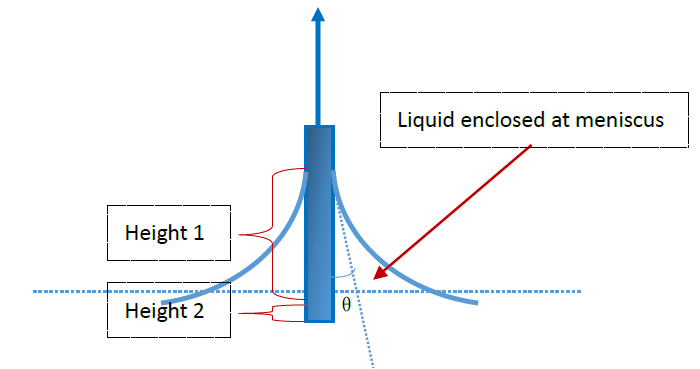 Please be noted that contact angle is not regard as 0°here because we find out that contact angle is about 29-32° in measuring process of surface tension (liquid-gas system). This will reduce value of surface tension about 1-3mN/m for measurement of surface tension. - Moving of sample stage: Classical Wilhelmy plate method will immerse plate into liquid about a height and then withdraw plate by same height, and measure surface tension by averaging several surface tension versus time (usually about 10 datas); But modified Wilhelmy plate method will not immerse and withdraw the plate. In this method, sample stage will stop once finding interface of liquid-gas or liquid-fluild. - Calculating equation: Classical Wilhelmy plate method used simplified equation without buoyancy and contact angle (this value is assumed as 0°). But, in modified Wilhelmy plate method, buoyancy and contact angle should be corrected by Young-Laplace equation or elasticity coefficient. Note：This method is used in surface tensiometer made by Kruss, KSV, KYOWA. And it cannot used to measure surface tension of cationic surface active agent and sample with viscosity due to its immersing and drawing out process. Note: Sometimes, we will repeat process 2, 3 after process 3 by rising stage and lowering stage several times, and calculate surface tension by average measured data. 1.2.4.1 Both Wilhelmy plate method and Du Noüy ring method is not suitable to measure interface tension between liquid-fluid system. 1.2.4.2 Both classical Wilhelmy plate method and Du Noüy ring method cannot be used to measure surface tension of viscous sample such as glycerol and adhesives. Because when plate or ring immersed and withdrew from viscous sample, adhesive force will affect at probe during movement of plate or ring and this force cannot be corrected by any way. So, usually when we used tensiometer based on classical Wilhelmy plate method or Du Noüy ring method, measured result will larger than actual value. Secondary, it is difficult to immerse plate or ring into sample with high viscosity. So, measurement cannot be carried out at this case. But with modified Wilhelmy plate method, you can measure surface tension or viscous sample and max viscosity can reach 10,000CP.s. 1.2.4.3 Both classical Wilhelmy plate method and Du Noüy ring method is not suitable to measure surface tension of surfactant especially cationic surface active agent. When measuring surface tension of surfactant based on classical Wilhelmy plate method, contact line between liquid and plate is keeping moving and will age new surface of surfactant. So, when we used classical Wilhelmy plate method to measure surface tension, if moving time and total measuring time is not agree with adsorbing time of surfactant to contact line, we may not achieve real value of sample’s surface tension. And usually, measured value is higher than actual one. 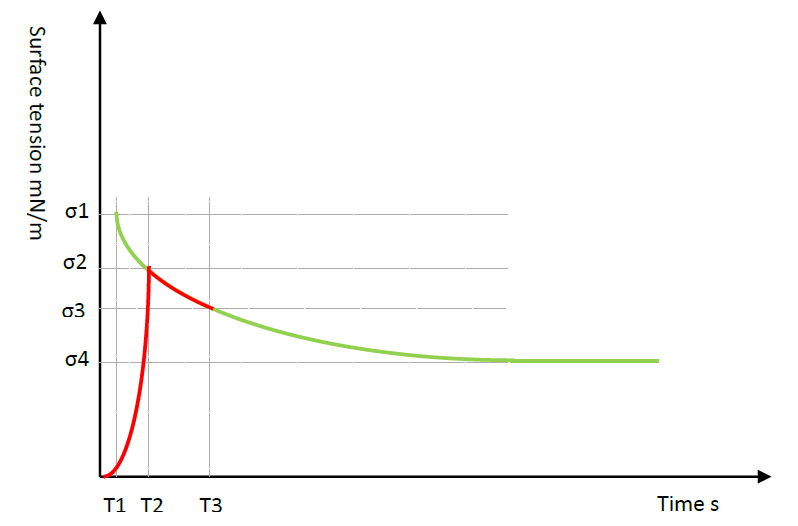 Red line means changing value of weighing during measuring process and green line means changing value of surface tension during adsorbing process. So, if at time T3, surfactant has not adsorbed totally to contact line between liquid-plate, measured values will be entirely higher than actual one. By contrast, in modified Wilhelmy plate method, surfactant will adsorb at interface between liquid and gas at first and adsorbs to contact line once plate touching interface, and will keep on adsorbing until contact line is full of surfactant as shown above. You can find out measuring process is quite agree with adsorbing process of surfactant. We have measured value of some surfactant, and find out that when measuring surfactant with longer adsorbing time, measured value used classical Wilhelmy plate method or Du Nouy ring method is much higher than modified Wilhelmy plate method. And we check out measured value measured by modified Wilhelmy plate method using pendant drop method and spinning drop method, all values are agree with each other. Because probe should be immersed into liquid in Classical Wilhelmy plate method or Du Noüy ring method, you must keep a height of liquid (such as 5mm?) to carry out measurement of surface tension. But in modified Wilhelmy plate method, plate should not be immersed in and we have invented a sample vessel made of PTFE to measure surface tension of liquid using volume about 1mL. 2.1 First consider measuring surface tension for viscous sample. If viscosity of your sample is higher than 500CP.s, classical Wilhelmy plate method and Du Nouy ring method is not your suitable choice. You can choose KINO’s tensiometer used modified Wilhelmy plate method or optical tensiometer based on pendant drop method or constrained sessile drop method. A simply way to adjusting whether your sample is suitable for using modified Wilhelmy plate method to measure surface tension is checking out if liquid is movable by inclining sample bottle. 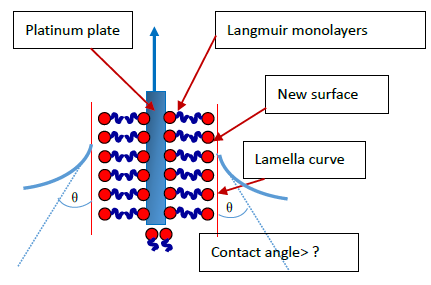 If sample is easy to move, you can use modified Wilhelmy plate method to get more accurate value of surface tension. If not so, this sample can only be considered as solid and using method of calculating surface free energy of it based on equation of state method. Contact us for comparing value of different viscosity that measured by different method. If your budget is enough to buy automatic critical micelle concentration measuring system (syringe pump system and corresponding controlling software), you can purchase one for you. But, using effect may be not as good as you supposed. We suggest you choosing measuring CMC by manual to find a proper concentration and then allocating several sample with concentration nearby CMC measured by manual to measure CMC more accurately. Such operations described above is instead more convenient and timesaving. For most cases of measuring surface tension of surfactant, all of three methods can be used, except measuring surface tension of surfactant with long adsorption time. Another phenomenon that we must pay attention is when measuring surface tension of surfactant, measured value will be reduced at about 0.2-0.5mN/m each step. This is caused by Langmuir monolayers described above. So, when measuring surface tension of surfactant using tensiometer based on Wilhelmy plate method or Du Nouy ring method, repeating measurement more than 5 time is not proper. We advise you to measure surface tension by repeating about 3 time. Or, you can stir sample and clean plate or ring, then measure surface tension. Value of surface tension will return to value you just measured. As you known, you get what you pay for. 3, Difference of surface tensiometer made by different manufactory. 1, Test method of update speed of balance is acquiring data from balance versus times about several seconds, and at same time, we used stopwatch to record times; after then, calculating speed of data updating by dividing number of data by time. And we find out that data update speed of Sartorius’s balance model WZA215 can only reach’s speed about 8-10 data/s when we using code “print: 1B 50 0D 0A”. If we used function of “Auto output on” at Sartorius’s balance model WZA215, update speed is about 20data/s, but we cannot control balance such as stop data outputting or power off, balance will continue to outputting data without control. 2, Max capability depends on max load of balance. So real range of max value is higher than 1000 or 2000mN/m. But when we used torsion wire sensor in tensiometer, max reload of sensor is just max capability in this sensor. 3, Pre-wetting is very useful when measuring surface tension of organosilicone surfactant or fluorine surfactant.